Seattle Mayor Jenny Durkan, in a rare step earlier this month, wrote British Columbia Premier John Horgan with “grave concern,” admonishing his government for not consulting with the city on a B.C. 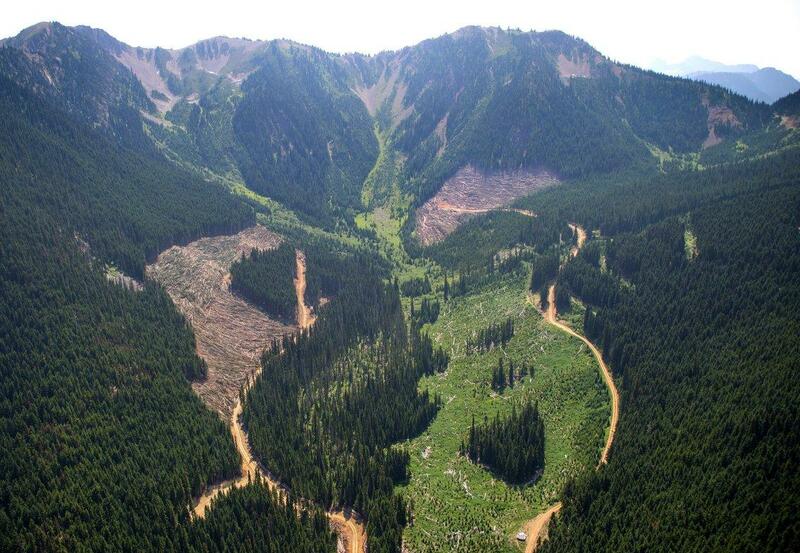 logging project some 125 miles away from Seattle at the headwaters of the Skagit River. To understand why, you must trace the river to its root. Begin at Puget Sound, and follow a braided tangle that twists through a shorebird-filled marsh. Upriver, the Skagit carves through a farming valley abundant with dime-sized blueberries and commercial flowers. Continuing east, chinook salmon, local orcas’ favorite food, wiggle through glacial runoff spilling through mountain gorges. Higher still, those waters churn past three dams, pumping electricity to Seattle in view of summer’s tourists. Above the Ross Dam, the water pools deep and cold, perfect for bull trout. Just above the 49th parallel, out of mind to most Washingtonians, is where the Skagit forms. In British Columbia, the stream is clear to the bottom seen from 2,500 feet above. Eighty-foot fir trees layer mountaintops. Higher, avalanche chutes slice through alpine meadows and remind summer visitors that snow piles up by the meter here. But amid the greenery, brown polygon cutouts of freshly felled logs emerge. They’re at the center of Durkan’s concerns – a controversy over a decades-old treaty involving two countries, loggers, miners and conservationists. Logging, she wrote, was “inconsistent with the spirit and intent of the 1984 Treaty,” and urged Horgan halt immediately plans for more. “Why the full assault by logging?” said Shaun Hollingsworth, a member of an international commission dedicated to the valley’s conservation. Crews this summer began to fell trees inside the donut hole at the behest of British Columbia’s government. Conservationists who once fought to keep Seattle from flooding the area now worry that B.C. will allow the valley to be hollowed at its center. Logging could threaten Ross Lake bull trout and disrupt possible grizzly-bear recovery efforts, some say. They fear logging, and road construction, will open the door further to mining, which they argue represents a grave threat to Puget Sound salmon on the horizon. The B.C. government office that auctioned areas for logging says the cutblocks represent a small fraction of protected lands in the watershed. As tensions rise, the Upper Skagit Valley is proving again that history rarely rests for long and faded intentions are sometimes tested by time. The Skagit River has long been part of a power struggle. In the 1970s, as energy consumption rose, Seattle City Light was among utilities that invested in joint nuclear-reactor projects. Residents soured as costs soared for the mismanaged projects. In 1976, the city council voted against buying into two new reactors, and bet instead on conservation and generating more electricity at city-owned Ross Dam. The only problem: City Light would need to raise the dam 122 feet to produce more power and flood miles of wilderness across the border. Seattle had begun constructing Ross Dam in 1937, raised it in three phases, and in 1949 finally settled at 540 feet, a height that spilled waters into Canada. The two nations spent years negotiating over payment for the flooding and whether Seattle could build even higher. The Canadians in 1967 agreed to allow Seattle to build taller for about $35,000 a year. That didn’t sit well with environmental activists. In the 1970s, they canoed down the Skagit in protest. A popular folk artist wrote a song in the valley’s defense. “We kept the pressure up,” said Ken Farquharson, a leading activist then, who remains involved in conservation efforts. Seattle Deputy Mayor Bob Royer, brother to Mayor Charley Royer, led negotiations with British Columbia. It took years, but he finalized a deal in 1984. The B.C. government would provide Seattle with cheap hydropower through 2065 in exchange for not raising the dam. The agreement created the Skagit Environmental Endowment Commission(SEEC), with four members appointed by the Seattle mayor and four by the B.C. premier. The agreement mandates that SEEC work to conserve the watershed, enhance recreation and acquire lingering mining and timber rights to protect the land. A treaty signed by the U.S. and Canada cemented the deal. “We got the same amount of energy for the same price we would have gotten if we raised the dam,” Royer said. Both parties saw it as environmental win-win. Years of controversy were put to rest. The so-called donut hole is something of a cartographic curiosity. On maps, it’s an island of public, unprotected land north of Ross Lake where the Skagit Valley and E.C. Manning Provincial parks meet. The Skagit River skirts the donut hole’s northern edge. Several tributary streams weave through mountainsides within. As the parks formed, the donut hole was created to preserve existing mining tenures. To Brian Kynoch, president of Imperial Metals, the company that owns the mining tenures, it’s an investment worth further exploration. To Hollingsworth, the Canadian co-chair of the SEEC, the land is a target. He wants the commission to help acquire mining tenures for conservation. For several years, SEEC has been negotiating with Imperial Metals over the donut hole with the province’s permission. So, when he found out two cutblocks had been logged there — work authorized by BC Timber Sales (BCTS), an arm of the provincial government – it was a surprise. Vivian Thomas, communications director for British Columbia’s Ministry of Forests, Lands, Natural Resource Operations and Rural Development, said SEEC was not directly notified of the auction but said BCTS held public meetings and published advertisements broadly outlining the agency’s forest plans. Areas within the donut hole were previously logged in 2004. Four cutblocks, auctioned in 2015 and totaling about 168 acres, are slated for harvest this year, Thomas said. By early August, permit-holder Interwest Timber had cut down about 30 percent of that area, she said. Estimated market value for the timber is about $2.1 million in U.S. dollars. Nearly 3.4 miles of new road were built for logging trucks to haul out about 780 loads of timber. “It is a very small portion of the donut hole that is being harvested, and a very small portion of the total area of the Skagit watershed that’s protected,” Thomas said. News of the logging operations among environmentalists incited anger south of the border. “You’re talking about a watershed and ecosystem that’s probably one of the most intact ecosystems in the Pacific Northwest today,” Connor said. Adding roads and hauling out lumber, she said, could have environmental effects downstream and disrupt habitat that stretches over the border. “To me it’s opening the door to consequences; we don’t know how they might play out,” she said. Several U.S. fisheries scientists cautioned that predicting downstream effects of logging can be difficult without knowing on-the-ground details. Sediment flowing downstream and localized, rising water temperatures are primary concerns. Some conservationists, like Connor, fear for salmon on the Skagit River, one of Washington’s best salmon-producing rivers, but the scientists doubted logging would affect downstream runs. Salmon habitat ends below the Gorge Dam near Newhalem and sediment is unlikely to pass the dams, they said. But bull trout, a species listed as threatened by the U.S. Fish and Wildlife Service, are much closer. They make their home in the frigid waters of Ross Lake and many spawn in the Skagit’s Canadian waters. The trout are the “polar bears of the North Cascades,” said Ashley Rawhouser, an aquatic ecologist at North Cascades National Park, “apex predators” of the river who need “wilderness-dominated mountain watersheds” to thrive. As climate change warms U.S. waters, Ross Lake could be one of the last refuges for the species, he said. Sediment could smother their eggs, kill their prey and impede young bull trout from catching meals, she said. Foy, of the Wilderness Commission, said logging is in grizzly-bear habitat, which is important should the U.S. decide to reintroduce grizzlies to the North Cascades. From roads and logging to mining? A focus on logging veils conservationists’ larger, but less immediate concern. “If the mine were in and we had to deal with the toxic materials going into the watershed, that’s what worries me for salmon,” Best said. She fears new roads could make buying out the mine harder and that logging could make the area less attractive as parkland. Metals, particularly copper, are toxic to salmon. Copper dissolved in water can interact with the gills of salmon and prevent proper breathing or cause dangerous ion imbalances in their bodies, said Jen McIntyre, an assistant professor at Washington State University’s School of Environment. Even low concentrations of dissolved copper can impair neurons, damaging salmons’ sense of touch and ability to smell. That can prevent them from finding food, evading predators or making their way to spawning ground, McIntyre said. When a dam breached in 2014 at Mount Polley, the site of an Imperial Metals mine near Williams Lake, B.C., it sent 8 million cubic meters of copper- and gold-mining waste into a nearby watershed, according to B.C. government figures. “We’re going to replay that in the Skagit? I don’t need to see that movie,” said Connor, of Forterra. Would the collapse at Mount Polley make it more difficult to mine in the Upper Skagit Valley? Once again, the Upper Skagit Valley has become a topic of international negotiations. Earlier this month, after meeting with SEEC, British Columbia put on hold, at least temporarily, the auction of logging rights to another 576 acres inside the donut hole scheduled for harvest next year. Seattle Mayor Durkan sent the letter protesting future logging but has yet to receive a response. Gov. Jay Inslee’s office is monitoring developments. Meanwhile, an environmental-law group, EcoJustice, has threatened court action over a permit that allows logging trucks to travel through Manning Park to the donut hole. Imperial Metals plans “more grass roots exploration” of their tenures, Kynoch said. The company funded a Ph.D. candidate’s thesis on deposits and is considering exploratory drilling of a recent gold discovery. More information could provide leverage in negotiations with SEEC. Foy, of the Wilderness Committee is rallying public opposition. “Any attempt to put a giant, open pit copper mine there would open the gates of hell with the public,” he said. Sediment, copper and public outcry can all flow downstream. Published: Aug. 16, 2018, 8:30 a.m.